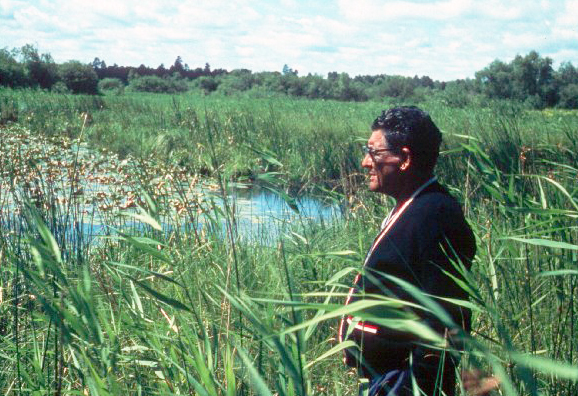 Paul Buffalo Meditating Wild Rice Beds. Ch. 1 "Early Life at Leech Lake"
Ch. 4 "Siouxs and Scouts"
Ch. 5 "Chiefs and Councils"
Ch. 6 "Spring Move to the Sugar Bush"
Ch. 7 "Skigamizigewin, Maple Sugar Time"
Ch. 8 "Old Gardens and New Bark"
Ch. 14 Ch. 13 "Manoominike-Giizis, 'Wild Ricing Moon'"
Ch. 15 Ch. 14 "Moccasin Game Gambling"
Ch. 16 Ch. 15 "Lacrosse and Other Camp Games"
Ch. 17 Ch. 16 "River Life and Fishing"
Ch. 18 Ch. 17 "Winter Wood and Wiigwaams"
Ch. 19 Ch. 18 "Late-Autumn-Winter Camp"
Ch. 20 Ch. 19 "Wenabozho and the Creation of the Current World"
Ch. 21 Ch. 20 "Tales of Wenabozho"
Ch. 22 Ch. 21 "The Windigo Cannibal and Other Life Trials and Adventures of Gwashun, the Boy Who Did Not Obey His Father and Mother: Our Favorite Story"
Ch. 23 Ch. 22 "Drums"
Ch. 24 Ch. 23 "Niimi'idiwin: 'Come and Dance, Come and Sing--Living and Spirits Alike'"
Ch. 25 Ch. 24 "Courtship, Marriage, and Living in with the In-Laws"
Ch. 26 Ch. 25 "'Self-Houses,' Sweat Houses, and Blood-taking"
Ch. 27 Ch. 26 "Dreams and Visions"
Ch. 28 Ch. 27 "Power"
Ch. 29 Ch. 28 "What's Behind the Sun? : An Indian Sermon"
Ch. 30 Ch. 29 "Midewiwin: Grand Medicine"
Ch. 31 Ch. 30 "An Indian Curing Ceremony"
Ch. 32 Ch. 31 "Spiritual Doctoring, Tipi-Shaking, and Bone-Swallowing Specialists"
Ch. 33 Ch. 32 "Medicine Men / Medicine Women"
Ch. 34 Ch. 33 "Messengers and Unusual Events"
Ch. 35 Ch. 34 "Fireballs, and the 'Black-Shadow-Man'"
Ch. 36 Ch. 35 "Boarding School Days"
Ch. 37 Ch. 36 "Jack Nason, 'My Dad. My Step-Dad'"
Ch. 38 Ch. 37 "Finns, 'The Sweatbath-Men'"
Ch. 39 Ch. 38 "Timber Days"
Ch. 40 Ch. 39 "Leech and Mississippi Forks"
Ch. 41 Ch. 40 "John Smith 'Wrinkle Meat'"
Ch. 42 Ch. 41 "Talking with the Old Folks: Recollections and Predictions"
Ch. 43 Ch. 42 "Hunting and Snaring"
Ch. 44 Ch. 43 "Cattle, Horses, 'Siouxs'"
Ch. 45 Ch. 44 "Churches and Missionaries"
"Out There in North Dakota"
"Uprise in the Indian Office"
"New White World . . . Living and Working with Rules and Regulations and the BIA, IRA, IRS, SSI, DNR, WPA, CCC, C.A.P., VISTAs. . . . "